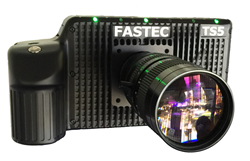 Fastec Imaging announces the TS5-H, a new High-Definition addition to the highly successful handheld TS3Cine and TS3/TS4 “Troubleshooter” high-speed camera family. Whether it’s used for troubleshooting in a factory, or for research in a lab, or bolted to a Kessler CineDrive in a cinematic studio setting, or in a sports stadium… or at the beach, the TS3-H is designed to help any shooter create vivid high-speed video. Fastec Imaging is a global manufacturer of digital high-speed imaging systems based in San Diego, CA. The company specializes in uniquely portable and affordable high-speed camera systems, including handheld, point-and-shoot systems, compact PC-controlled cameras, and long duration record systems. Fastec cameras are used in many applications, including engineering, industrial manufacturing, packaging, medical and academic research, bio-mechanics, military range testing, sports performance, and broadcast entertainment. For additional information, please visit Fastecimaging.com.